Christmas is a holiday to build lifelong memories with both your family and friends. As people grow older, the way they see Christmas changes. You don’t see it as a tree filled with presents under it anymore. You probably start thinking of it as an opportunity to see family come home, old friends returning from college, and other people you may not get to see that often. What Christmas means changes to people as they go through different stages of their lives. When they are in grade school, it’s all about the presents under the tree. Traditions for younger kids may be to write Santa letters, bake him cookies or wake up early on Christmas morning to see what Santa brought. As kids get older things change and they start to realize that Christmas is not all about what Santa brought. It is about spending time with family that you may never see and making new memories and traditions. Students at Skyline have various traditions. There are many different versions of this game in which generic gifts can be traded or stolen. “We always play Dirty Santa at grandma’s house,” sophomore Brynn McKennon said. Whatever your traditions are, they make Christmas better. 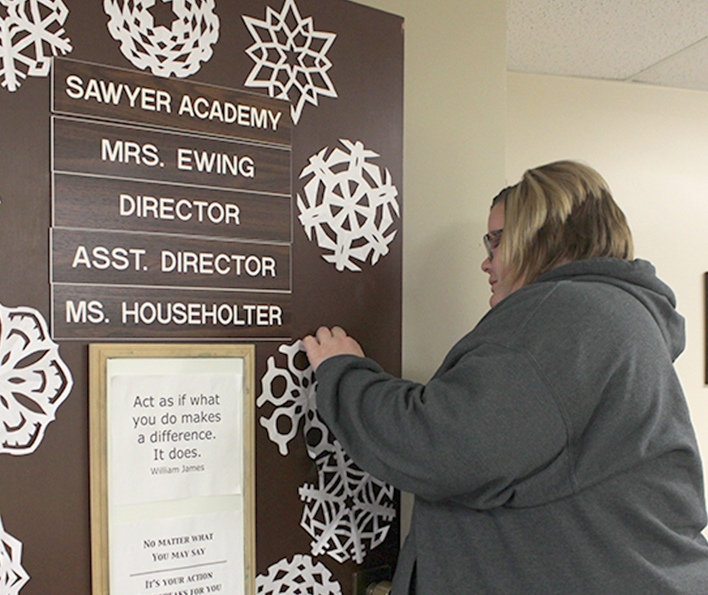 Meagan Householter, the Assistant Director of the SawyerVirtual Academy, decorates her door with snowflakes that she made. “I wanted to be festive and I like cutting out different snowflakes, plus they can stay up all winter, not just Christmas,” Householter said. 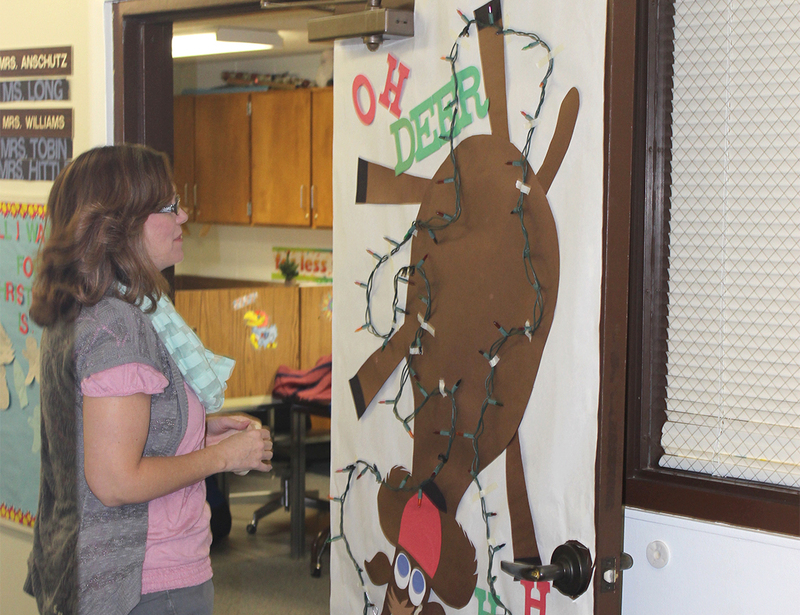 Para-educator Melissa Hittle steps back to look at the decorations on the resource room door. This is Hittle’s first year at Skyline. Last year, the Pep Club decorated the doors, but this year the Resource Room teachers took it upon themselves to decorate. This entry was posted in Features, Other. Bookmark the permalink.